There could be a thousand and one reasons for people to hide the changes in the relationship, especially the relationship that has gone south. This kind of change in life usually draws people attention quite effectively and it could be of course embarrassing to have unpleasant comments or questions posted to your Facebook wall about the change. Furthermore, the recently introduced Breakup Notifier has bring significant convenience to the people who wish to stalk at someone’s relationship status. The helpful Facebook application will instantly generate an email notification to the people who “worry” about your relationship status whenever your relationship status changes. 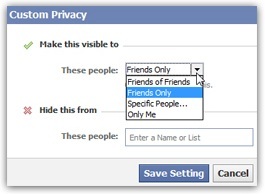 Login to Facebook and select “Privacy Settings” from the “Account” menu at the top right corner. Click “Customize settings” link from the “Choose Your Privacy Settings” page. Look for the Relationships setting under the “Things I Share” section. Click at the “edit” link from the Custom entry in the drop-down menu. The Custom Privacy pop-up window appears and you can now configure your relationship status is visible only to limited individuals or groups, or even to yourself only. You are also given an option to specify the contacts who shouldn’t get to know about your relationship status at all. Click “Save Setting” once you are happy with the configuration. It is now safe to make changes to your relationship status from the Featured People page in Facebook.